Observability: Highly distributed applications consist of many internal and external functions, microservices, and external integration points. Observability platforms provide developers and DevOps teams only with the alerts and dashboards for events and metrics that point toward cost, performance, availability, and compliance problems. IDEs: IDEs with serverless integration automate most elements of serverless development that could be initial stumbling blocks. Deployment automation: Serverless deployment tools enable developers and DevOps teams to specify application architectures via API and to templatize applications for continuous compliance and security. Development tools and platforms: Developing serverless distributed applications means for developers to make adjustments to areas such as debugging, building, testing, and deploying their code. Service Mesh: Service mesh products aim to hide the complexity of securely connecting serverless functions, mircoservices, and external services from developers. 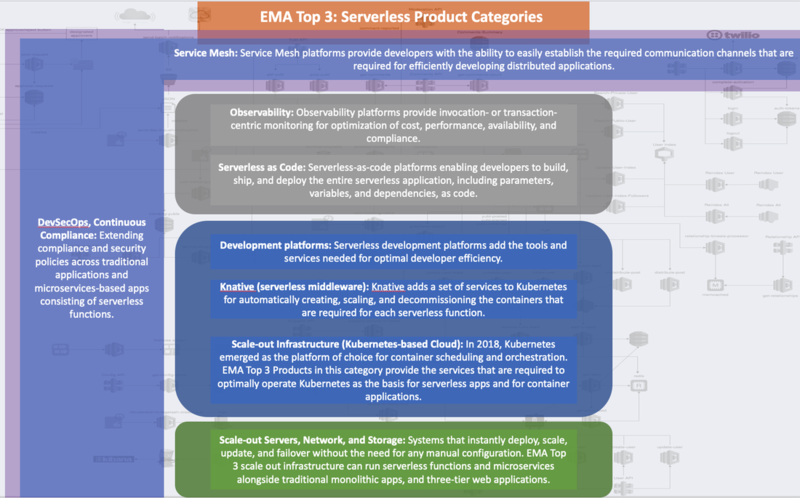 Enterprise Management Associates research identified four key categories of serverless products addressing the 10 key serverless pain points enterprises seek to address today.